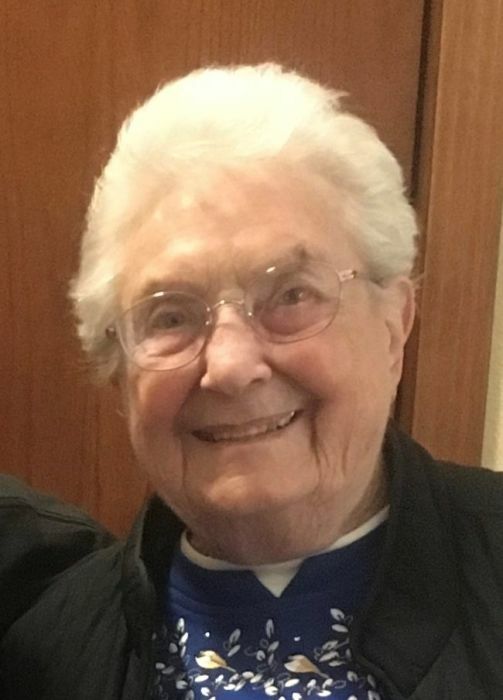 Obituary for Kathryn "Kitty" (Stygar) Nauman | Peterson Kraemer Funeral Homes & Crematory Inc.
Kathryn “Kitty” Nauman was knocking on Heaven’s door and God opened it on April 9th, 2019. She was born on March 31, 1929, to Peter and Anna (nee Jones) Stygar in Eau Claire, Wisconsin. She married her loving husband Vernon on September 2, 1950. They moved to Wausau where they raised their family, moved to Madison and later retired to the Turtle- Flambeau Flowage where they spent many years enjoying nature. Mom tended her garden and her green thumb was evident by her beautiful flowers and vegetable gardens. She loved to quilt and completed a quilt for each child, grandchild, great grandchild and made many more so future great grandchildren would receive one of her special quilts. Mom loved getting away from the Wisconsin winters traveling with dad to Bullhead City, Arizona; and also looked forward to their trips to Alaska to visit her daughter and her family. She recently attended a baby shower for her soon-to-be 13th great grandchild and celebrated her 90th birthday by going out for lobster, which she truly enjoyed. Mom will be remembered for her vibrant spirit, wit and hilarious sense of humor and her constant smile. In life she was an eternal-optimist and always ready with a good joke. She lived with happiness in her heart and through that loving-wisdom encouraged those around her to do the same. Mom loved and took pride in her children, grandchildren and great grandchildren. She left footprints on our hearts and we are thankful for the wonderful memories. Mom is survived by her loving husband of 68 years, Vernon; her children, DiAnn (Terry) Hrdina, Wausau, Jean (Jay) Schultz, Anchorage, Alaska, Mark (Julie) Nauman, Mosinee, Peggy (Dale) Zimick, Wausau; 12 grandchildren, Chad Hrdina (Michael Zgoda), Kelli (Torrion) Amie, Vicki (Steve) Hall, Brenda (Greg) Kaetterhenry, Jodi (Garrett) Newell, Jeremy (Amanda) Schultz, Jacob (Elizabeth) Schultz, Josh (Sara) Schultz, Ethan Nauman, Megan Nauman, Niki (James) Mataczynski, Kyle Zimick; and 12 great grandchildren. She is also survived by her brother Bob Stygar, sister Pat Heffernan, numerous nieces and nephews and a special cousin, Dave Gibson, Reno NV. She was preceded in death by her sister-in-law Helen Stygar and brother-in-law Bob Heffernan.